These Southwest Chicken Quinoa Bowls are a big, hearty, satisfying meal, full of flavor and perfect for dinner or as an easy-to-pack lunch! Southwest seasoned chicken, sweet corn, juicy tomatoes, hearty black beans, rich avocado, fresh lime and a creamy yogurt dressing are all served over a bed of quinoa for a tasty explosion of flavors and textures. 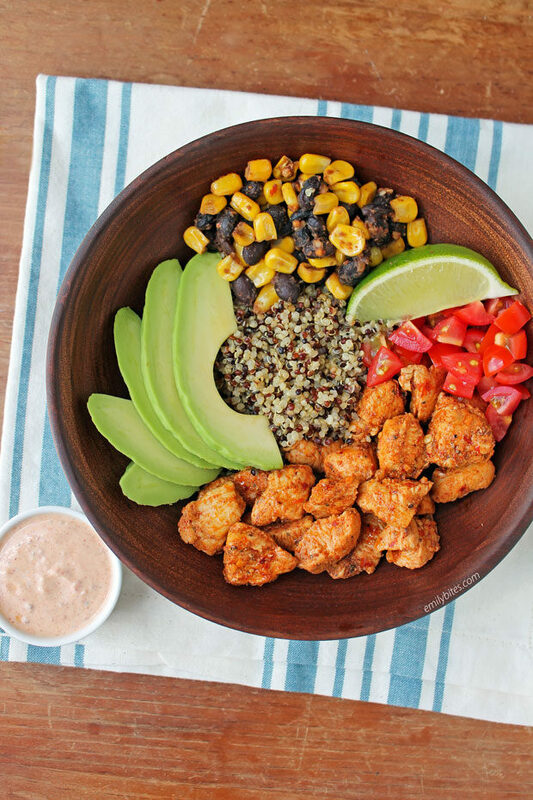 This bowl packs 8 grams of fiber and 36 grams of protein to fill you up and keep you feeling satisfied, and each of these Southwest Chicken Quinoa Bowls is just 413 calories or 6 Weight Watchers Freestyle SmartPoints! I love these bowls the way I suggested them, but you can always customize them to make it your own by substituting rice for quinoa or taco seasoning for southwest seasoning or adding additional veggies like peppers and onions or sauces like salsa. Get creative! Also, we have a rice cooker that I always use to make my quinoa (2:1 liquid to dry quinoa ratio, using broth or water, brown rice setting), but you can also easily cook it on the stovetop by following the package instructions. Looking for more tasty quinoa recipes? Check out my Greek Chicken Quinoa Salad, Chicken Parmesan Quinoa Bake, Strawberry Quinoa Salad, Chicken Fried Quinoa, Buffalo Chicken Quinoa Bake, Butternut Squash Quinoa Salad, Beef Enchilada Quinoa Bake or the Quinoa category in my recipe index! Place the raw chicken pieces into a Ziploc bag and sprinkle with 4 teaspoons of the Southwest seasoning. Seal the bag and shake/massage until the chicken is coated with the seasoning. Bring 1 teaspoon of the canola oil over medium heat in a medium sized skillet. When the oil is hot, add the chicken pieces and stir them around to coat with oil. Arrange them into a single layer and cook for 5-6 minutes, flipping occasionally, until the chicken is cooked through. Remove the chicken to a side plate. Keep the skillet over medium heat and add the beans, corn and garlic. Stir together and cook for another 1-2 minutes. Remove from heat. To make the dressing, in a mixing bowl, combine the yogurt with the remaining 2 teaspoons of southwest seasoning, the lime juice, the vinegar and the garlic powder. Stir together and then add 1-2 tablespoons of water to reach your desired creamy consistency. To build each quinoa bowl, combine ½ cup cooked quinoa (can be warm or room temp), 3.5 oz cooked southwest chicken, ¼ cup of the beans and corn mixture, 2 tablespoons of chopped tomatoes, 1.5 oz of avocado and 2 tablespoons of the dressing. Garnish with a lime wedge to squeeze over the top and serve. Makes 4 bowls/servings. This looks like the perfect dinner for 100-110 degree summer weather in Austin. Ugh! I’m bummed that the local stores have stopped carrying McCormick Southwest seasoning. I had to order 3 bottles on Amazone to make sure I have enough to last awhile. I love that spice! How long do you think these and the yogurt dressing would hold up in the fridge?